• Ki67 (rm), ImmPRESS™ Universal Reagent, DAB HRP substrate (brown). • CD34 (m), ImmPRESS™ Universal Reagent, Vector® VIP HRP substrate (purple). In general, immunoenzymatic methods can be used to stain two or more antigens in the same tissue section when the antigens are located in different cell types or different compartments of the same cell. In cases where the two antigens are co-localized in the same compartment of the same cell, e.g., two nuclear antigens, immunofluorescence techniques may be preferred. • Cytokeratin 5 (m), VECTASTAIN® Universal ABC-AP Kit, Vector® Blue AP substrate (blue). 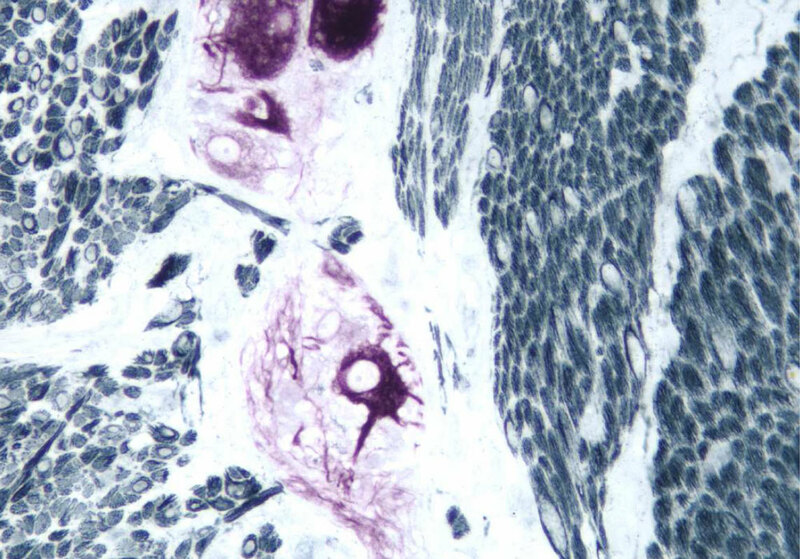 • CD34 (m), VECTASTAIN® Universal ABC-AP Kit, Vector® Red AP substrate (red). 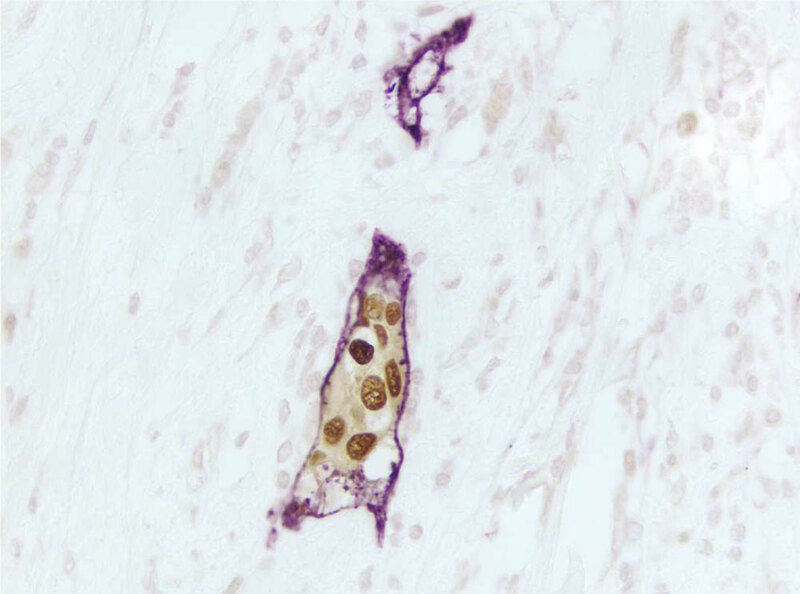 • CD10 (m), ImmPRESS™ Anti-Mouse Ig Reagent, DAB+Ni HRP substrate (gray/black). 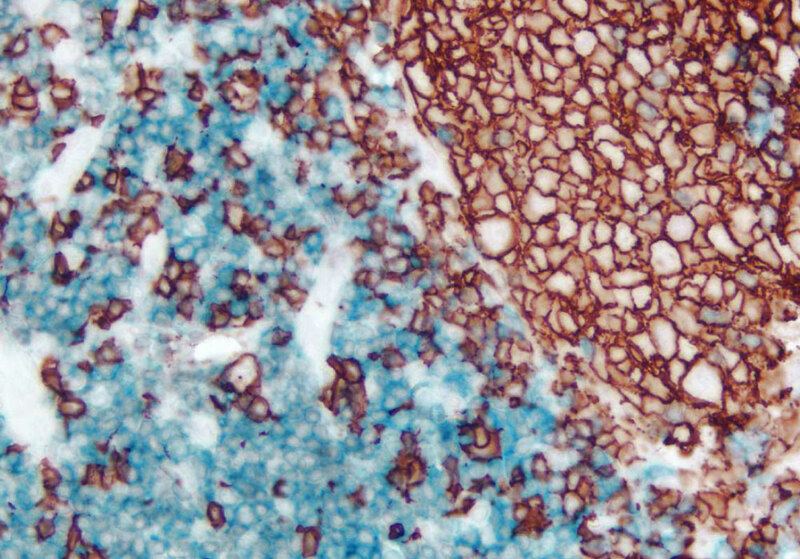 • Cytokeratin 20 (m), ImmPRESS™ Anti-Mouse Ig Reagent, Vector® NovaRED™ HRP substrate (red). Successfully labeling multiple antigens in the same tissue section requires the use of detection systems with high sensitivity and low background as well as substrate choices that yield good color contrast. Because Vector Laboratories’ peroxidase and alkaline phosphatase detection systems and their substrates are widely acknowledged for having these qualities, they are particularly suitable for this application. The wide range of substrates from Vector Laboratories, both classic and unique, provide numerous color choices for optimizing a multiple labeling procedure. The choice and combinations of substrates depends on various factors. Substrates should provide high color contrast so that each antigen is clearly delineated. Substrates should fulfill sensitivity requirements, precipitation characteristics for a given tissue, and stability requirements in the mounting medium. Finally, the ability to inhibit endogenous enzyme activity must also be addressed when choosing a combination of substrates. Different enzyme systems and their substrates used to label each antigen. 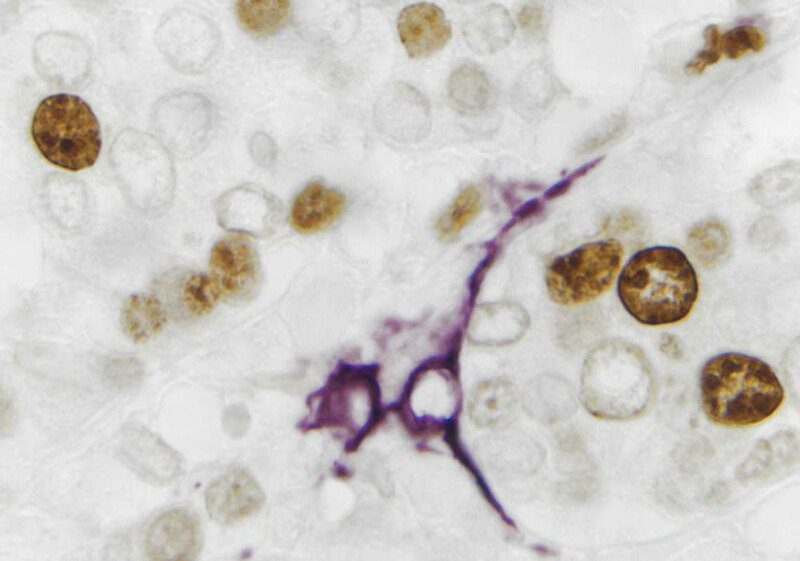 • CD34 (m), VECTASTAIN® Universal Elite® ABC Kit, DAB+Ni HRP substrate (gray/black). • Cytokeratin 8/18 (m), VECTASTAIN® Universal Elite® ABC Kit, DAB HRP substrate (brown). • Neurofilament 200kD (m), ImmPRESS™ Anti-Mouse Ig Reagent, Vector® VIP HRP substrate (purple). • Desmin (m), ImmPRESS™ Anti-Mouse Ig Reagent, Vector® SG HRP substrate (blue/gray). 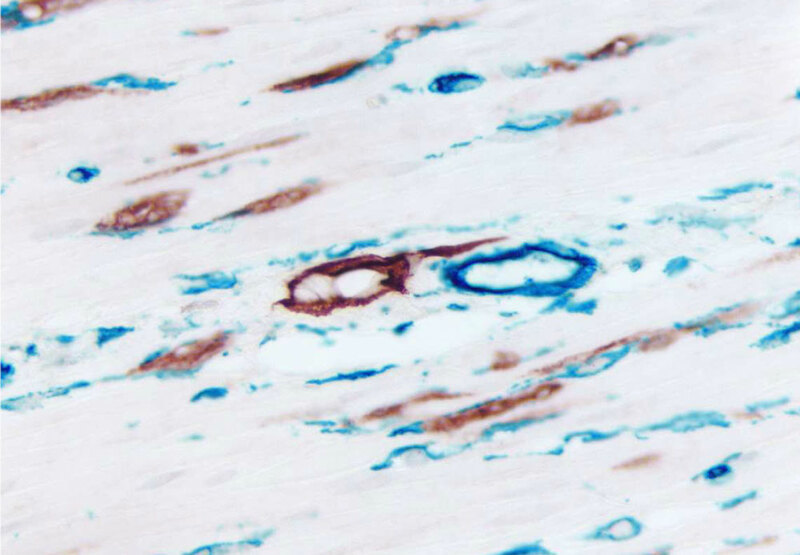 • CD3 (m), VECTASTAIN® Universal ABC-AP Kit, Vector® Blue AP substrate (blue). • CD20 (m), ImmPRESS™ Universal Reagent, Vector® NovaRED™ HRP substrate (red). 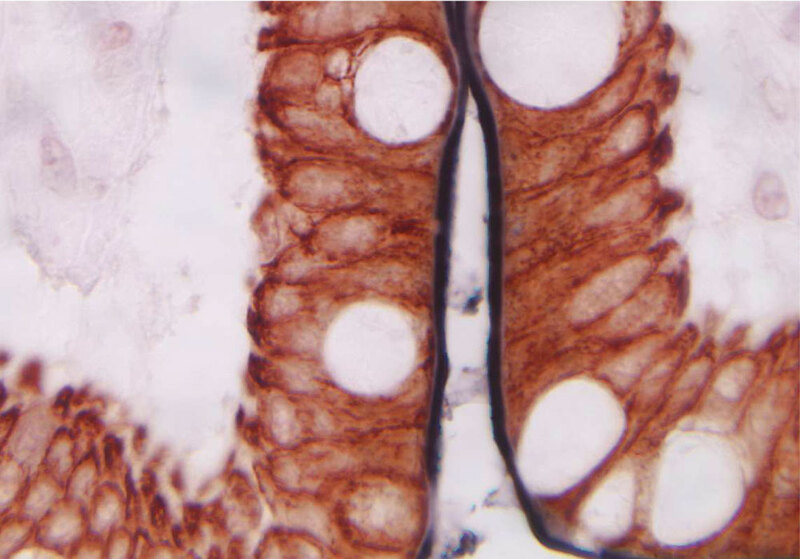 • Ki67 (m), VECTASTAIN® Universal ABC-AP Kit, Vector® Red AP substrate (red). In general, peroxidase substrates produce sharper, denser precipitates with crisp localization. Vector® NovaRED™ (red), Vector® VIP (purple) and DAB and DAB/Ni (brown or black) are essentially equivalent in sensitivity and can be permanently mounted. Vector® SG (blue/gray) and AEC (red) are less sensitive than DAB. Vector® SG can be permanently mounted, but AEC must be aqueously mounted as it is soluble in alcohols and other organic solvents. Although TMB is the most sensitive peroxidase substrate, it produces a more diffuse, less localized reaction product. It is not recommended for multiple labeling unless it is necessary for the detection of antigens that are present in very low concentrations. 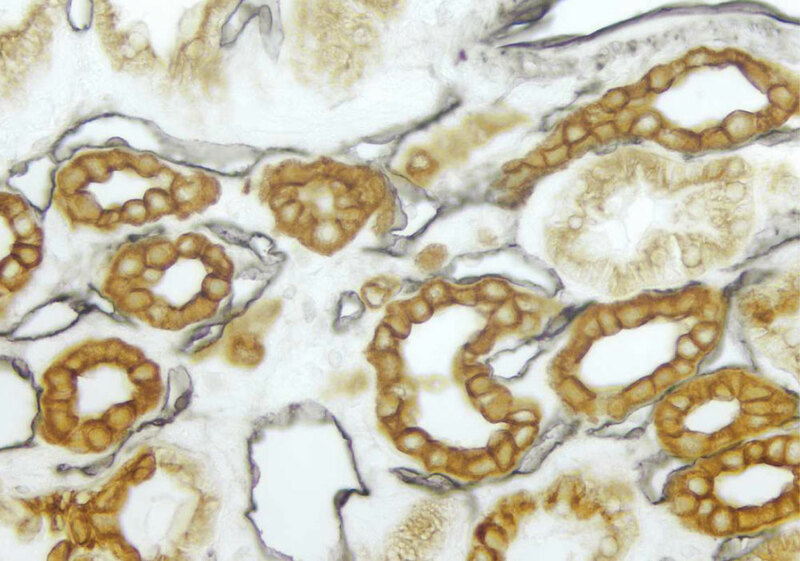 When staining neural tissue, peroxidase substrates are usually preferred because they give more consistent labeling of both cell body and processes. Alkaline phosphatase substrates are more diffuse and translucent than peroxidase substrates. Vector® Red (red) and Vector® Blue (blue) are equivalent in sensitivity to the peroxidase substrate DAB. Both are dehydratable. 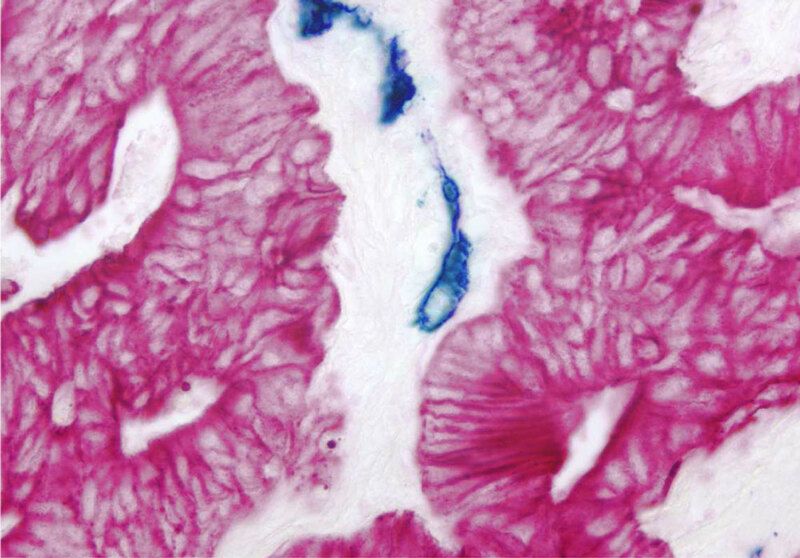 BCIP/NBT substrate (blue/violet) is the most sensitive of all the chromogenic substrates because it continues to develop over many hours increasing in sensitivity with time. It can be used for multiple labeling in situations of low antigen concentrations, and it is dehydratable for permanent mounting. Vector® Red is unique. It is fluorescent and dehydratable. 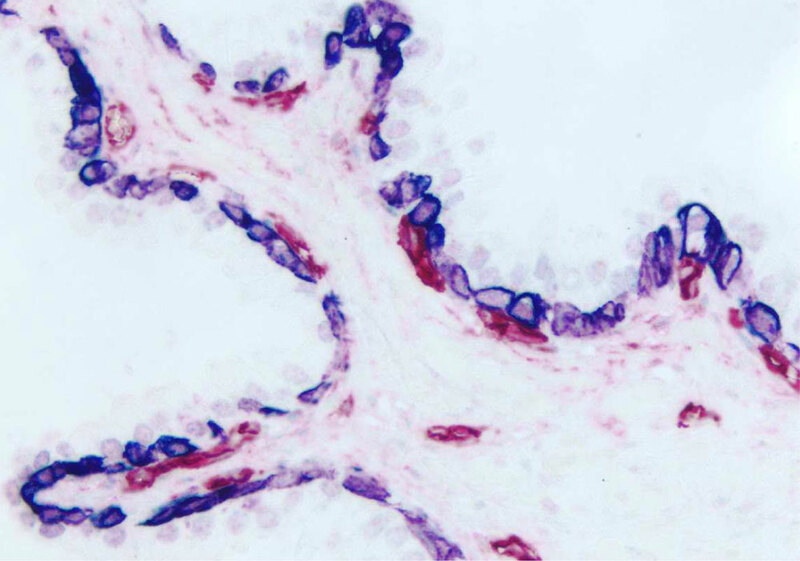 It can be viewed with a fluorescence microscope using a rhodamine or Texas Red® filter. Vector® Red can be used in fluorescent multiple label protocols in combination with fluorochromes like fluorescein, and is compatible with fluorescent counterstains like DAPI. Vector® Red, as well as DAB, is also recommended for sequential, multiple label in situ hybridization (ISH) or IHC/ISH, because of its stability throughout ISH procedures. Relative intensities of substrates should be taken into account - and primary antibody concentrations adjusted if possible - to ensure optimal results in any multiple labeling procedure. • Cytokeratin 8/18 (m), VECTASTAIN® Universal ABC-AP Kit, Vector® Red AP substrate (red). 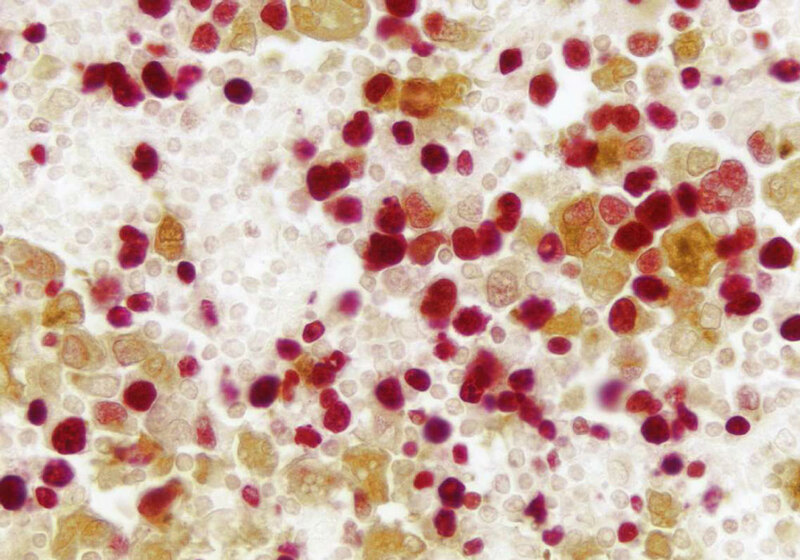 • M2A Antigen (m), ImmPRESS™ Universal Reagent, Vector® NovaRED™ HRP substrate (red).